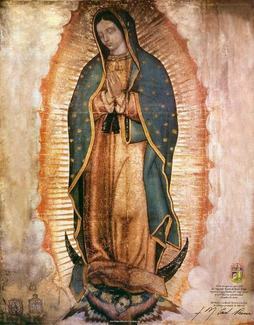 Scroll down and find the week you would like to take home an Our Lady of Guadalupe Prayer Kit. Included in the Prayer Kit will be an image of Our Lady of Guadalupe, a standing crucifix, a votive candle, rosary beads, and a "How to Pray the Rosary Guide." 1. Click in the: "Sign Up" check-box alongside the Mass date and time you choose to pick up the Prayer Kit. 2. Click on the: Submit and Sign Up button on the bottom of the page. and click on the Sign Up Now button on the bottom. You will get an email reminder two days before the Mass date you signed up for. 1. Parish Volunteer Coordinators will be at all the Masses to assist you in picking up and returning the Prayer Kit. 2. Please PICK UP your Prayer Kit AFTER Mass from the Coordinator who will be looking for you in the back of the Church (probably holding the canvas tote containing your Prayer Kit). 3. Please RETURN the Prayer Kit to the Coordinator in the back of the Church BEFORE the start of Mass the following weekend . . . at the same Mass time that you picked up the Prayer Kit. Reserve a Prayer Kit for one week. Pick up your Prayer Kit AFTER Mass. Please return your Prayer Kit BEFORE Mass the following week (pick up and return the Prayer Kit at the same Mass time for both weeks). I have the kit and I will keep the kit another week if no one signs up for it.